Many readers may remember the teardown of Camera v2.5 that introduced a new feature called "Smart Burst." At the time, it was incomplete and presumably still in the early stages of testing. Rather than relying on destructive image enhancement techniques and automatic edits, Smart Burst focused on rapidly taking multiple pictures and picking out the best among them. <string name="dogfood_popup_text">"This version of Google Camera is internal only. Please don't talk about it or show people outside Google. Check out SmartBurst, a feature that intelligently captures interesting moments and a GIF and a collage. To activate, hold down the capture button in the rear-facing camera for as long as you'd like. So, what can we tell instantly from this text? To begin with, it's obviously an explanation for dogfooders, Google employees that are chosen to test an app before it is to be released to the public. The most important elements here are directions for the use of Smart Burst and a clear list of what it will produce. The feature is activated like most cameras that offer a burst mode, by holding down the shutter button for as long as necessary. This tells the camera to capture frames at whatever speed it's capable of until the user lets go or the device runs out of available space. The results are then scored and the winners will likely go into more permanent storage while the losers will either be erased or possibly held for review. Some images will also be chosen for a collage and/or a GIF. It's also worth calling attention to how specifically the explanation refers to the rear-facing camera. Assuming this isn't changed, it could mean Smart Burst isn't going to be offered with the front-facing "selfie" camera. No matter how anybody feels about the word (which is horrible) or the actual act of taking your own picture with a cell phone, there is certainly an audience that would love to get these features with a front-facing camera. There are a few more strings specifically related to Smart Burst, but they aren't very exciting. The only additional note is that one string confirms there will be a "Burst Viewer" as the previous teardown suggested. It's still not clear exactly which photos are shown in this viewer. This wouldn't be a Google product if there wasn't a new titular noun to go with a major feature. In this case, it's going to be called "Creations." At least this name is fairly on the nose, unlike, say, Google Keep. 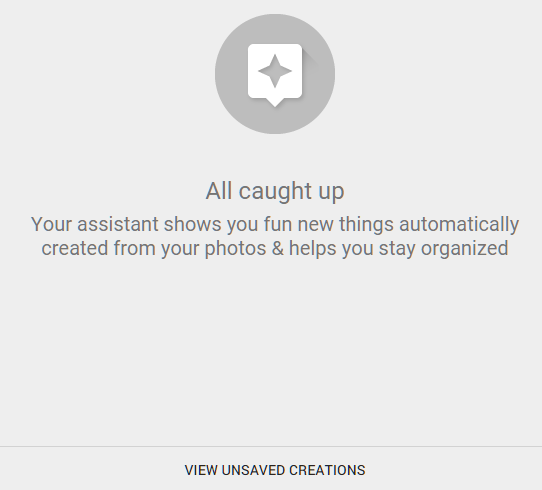 This isn't the first use of the term Creations, it also appears on the Google Photos website in a couple of spots, like in a bar across the bottom of the Assistant page that goes to Unsaved Creations. We already learned that the Creations produced by Smart Burst can include a collage and "a GIF." Let's also be specific to clear up any possible confusion: this is an animated GIF, not just a single image in GIF format. Let's also make a safe assumption that both the collages and animated GIFs are going to be of the same style that began under the name Auto-Awesome in Google+ Photos more than two years ago. Of course, these same features live on today in Google Photos. So why is Google also adding them to the Camera app? I... uh... I don't know. Maybe there are some really magical tricks Smart Burst can accomplish that just aren't possible once Photos takes over, or maybe the two apps are just going to have some overlapping functions. Collages and Animations may be old features, but there are two arguably new-ish things appearing as types of Creations: Group Smiles and Photo Booth. Both names leave very little to guess about, since smile detection was a big part of the Camera v2.5 teardown and more recently turned up in the Google Play Services v7.8 Face API. Photo Booth isn't exactly spelled out, but it's pretty likely going to replicate the classic four-frame photo booths we've seen immortalized in older TV shows, movies, and evidently a dedicated festival. Do auto-generated Creations sound terrible to you? Are you turned off by the idea of having an algorithm do anything to your photos that you didn't do yourself? Wow, you're kind of a downer. What do you have against fun? Nevertheless, you can totally disable auto-generated Creations. This will come in handy if you're running low on space or trying to preserve battery, though if those conditions are an issue, maybe using Smart Burst at all isn't the best choice. For now, these features look mighty similar to things we've already seen from Google. Smart Burst can certainly achieve some better results than Google Photos since it has a dense stream of single shots to work with; but how much better are those results going to be? Sure, we'll get some pictures with bigger smiles, fewer accidental blinks, and maybe some good candid moments. Will that be enough to wow users? Probably not. In fact, these are the kinds of improvements that make a much better experience, but they mostly go unnoticed because the results aren't very subtle. We should really ask what we'll see from this technology in the future. It's difficult not to look at Apple's Live Photos feature launching with the iPhone 6 and think of how Smart Burst is already doing the same (and more) work. Yes, it's a gimmicky feature, but it's a gimmick that a lot of people are actually going to like; and Google has already been doing something similar for more than two years. This is just the tip of a very large iceberg, there's a lot of potential in the image processing Google is working with. This is just the beginning of what can happen for Google Camera. With that said, keep in mind that this is just the first part of the teardown. Part 2 is in the works, so keep an eye out for it tomorrow. I promise it won't be quite as long.